I have a bunch of MP3 files on my SMB share (a Linux home server). The SMB server used to be named "sega-SMB" and I renamed it to just "sega". The problem with iTunes is that if I don't connect to the "sega" SMB server and mount the share (its name never changed) in Finder before attempting to start playing any song that is on this "sega" SMB server, iTunes attempts to connect to the old "sega-SMB" name. It errors out saying that it can't connect to the server. It is not lying. The "sega-SMB" server is not on the network anymore. There's only "sega" now. So, iTunes somehow cached the old SMB server name. If I first connect to the SMB server and mount the share via Finder and then try to play a song in iTunes, it has no problem figuring out the path to an MP3 file. Basically, if I just logged in and started iTunes and want to play music it attempts to connect to my SMB server using old name that is no longer valid. If I connect via Finder and mount the share, iTunes has no problem playing the music. I was wondering if there's a way to delete this cached record somehow, somewhere. I've been searching for a solution on Google but haven't been able to find anything yet. I tried clearing all recent connections in "Connect to Server" dialog. I also tried deleting obsolete keychain entries. None of that helped. Start iTunes, select iTunes, Preferences..., then the Advanced tab. Click the Change button, and in the dialog navigate to the location of your media. 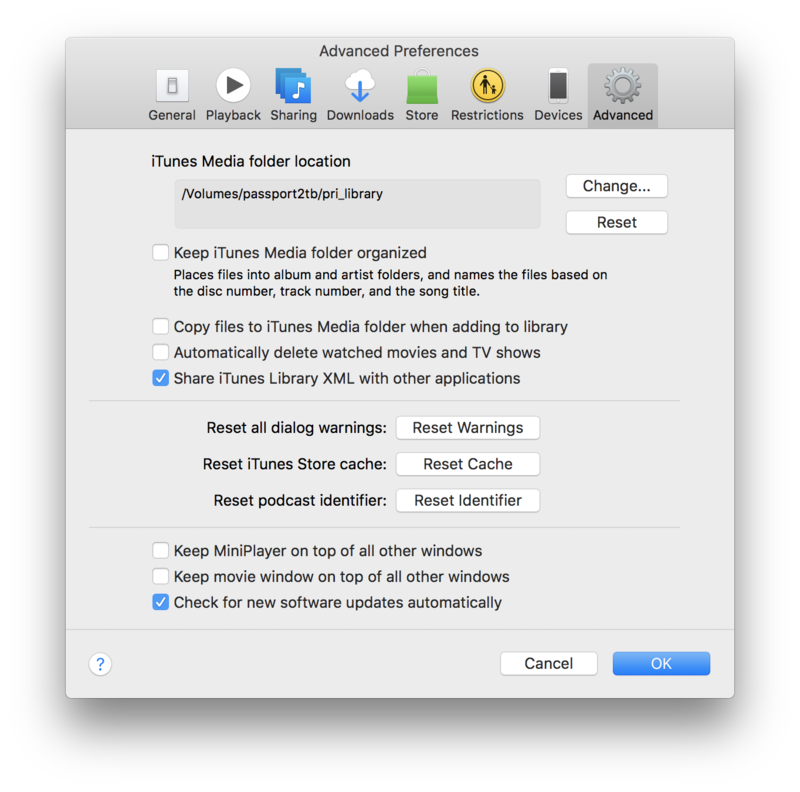 Note that there are other options in the Advanced tab that will give iTunes greater autonomy over your file system than it already has. I've found them to be recipes for chaos, disaster and confusion, so I don't check them see this screenshot. The SMB server name is "cached" (e.g. saved) in the Keychain. You can use the Keychain Access app to edit/delete saved server connection credentials. Not the answer you're looking for? Browse other questions tagged itunes smb samba . How can I have Finder mount an SMB share from ssh without confirmation?